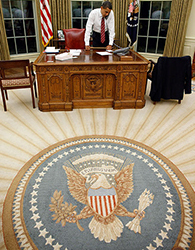 The Seal of the President of the United States is used to mark correspondence from the U.S. president to the United States Congress, and is also used as a symbol of the presidency. The central design, based on the Great Seal of the United States, is the official coat of arms of the U.S. presidency and also appears on the presidential flag. The presidential seal developed by custom over a long period before being defined in law, and its early history remains obscure. The use of presidential seals goes back to at least 1850, and probably much earlier. The basic design of today's seal originated with Rutherford B. Hayes, who was the first to use the coat of arms on White House invitations in 1877. The precise design dates from 1945, when President Truman specified it by an executive order. The only changes since were in 1959 and 1960, which added 49th and 50th stars to the circle following the admissions of Alaska and Hawaii as states. The current seal is defined in Executive Order 10860, made by President Dwight D. Eisenhower on February 5, 1960, and effective since July 4, 1960. It states The Coat of Arms of the President of the United States shall be of the following design: SHIELD: Paleways of thirteen pieces argent and gules, a chief azure; upon the breast of an American eagle displayed holding in his dexter talon an olive branch and in his sinister a bundle of thirteen arrows all proper, and in his beak a white scroll inscribed "E PLURIBUS UNUM" sable. CREST: Behind and above the eagle a radiating glory Or, on which appears an arc of thirteen cloud puffs proper, and a constellation of thirteen mullets argent. The whole surrounded by white stars arranged in the form of an annulet with one point of each star outward on the imaginary radiating center lines, the number of stars conforming to the number of stars in the union of the Flag of the United States as established by chapter 1 of title 4 of the United States Code. The Seal of the President of the United States shall consist of the Coat of Arms encircled by the words "Seal of the President of the United States." The blazon (design) is essentially the same as the obverse of the Great Seal of the United States as defined in 1782, although with some extra colors specified, and a different arrangement of the stars, clouds, and glory than is typically seen in modern versions of the Great Seal. The only purely distinct element is the ring of 50 stars, representing the 50 states. Likewise, the symbolism follows that of the Great Seal: The stripes on the shield represent the 13 original states, unified under and supporting the chief. The motto (meaning "Out of many, one") alludes to the same concept. The arc of thirteen clouds, and the thirteen stars, also refer to the original 13 states. The olive branch and arrows denote the powers of peace and war. The eagle faces towards the right to show a preference to peace over war.